OK, this pie doesn’t actually cost $100… unless you rent a Zip car for 6 hours, drive upstate to have brunch in New Paltz and pick the apples yourself at $10 a bag. But even then, this pie is well worth it ~ it’s hands down the best apple pie I’ve ever had! This year we used sweet-tart Mutsu and intensely tart Fuji apples that transformed magically in the oven, coming out smelling and tasting of roses~no joke, there was a pronounced floral scent and flavor that was absolutely intoxicating! We don’t really know why this was, but we’d just picked the apples themselves at our favorite farm, so they were über-fresh and particularly flavorful this year. That, and Orville is quickly mastering this recipe with his particular pie magic. After our fabulous brunch at Main St. 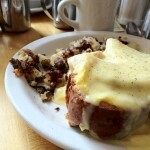 Bistro in New Paltz, NY –witness my Zoo Canoe with eggs, bacon, tomatoes, and cheese stuffed in a hunk of citrus-pecan bread and topped with hollandaise–we headed over to Wright’s Farm in Gardiner where we’ve picked apples and pumpkins for several years now. 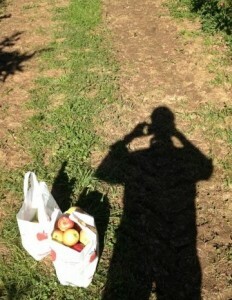 It’s a lovely place with a friendly staff, and the apple picking is fantastic! Perfection just out of reach. But is it worth parting with Siri? Taken with the missing iPhone – all is well! Orville called the Main St. Bistro while we drove back to the Wright’s Farm store to ask at the counter where we got out apple bags. Zilch. No luck. 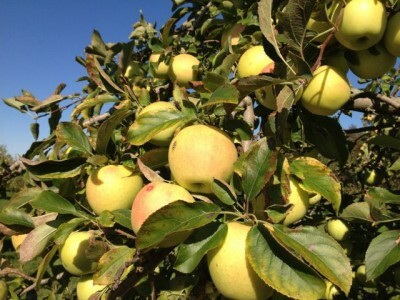 Back up to the Golden Delicious grove. I looked at the grove and closed my eyes. Breath. Calm. Open them. Walk, slowly, see everything, empty the mind, take it in, breath, calm, be. Five minutes later, I found it. Since I have a white iPhone, I couldn’t imagine how I could miss it in the grass, but it fell out of my pocket [not by the jumping spot, either, go figure] along with my ZipCar card [a loss I wouldn’t even have noticed for days, probably], which is green and gray, and not much white was showing. Whoo Hoo! 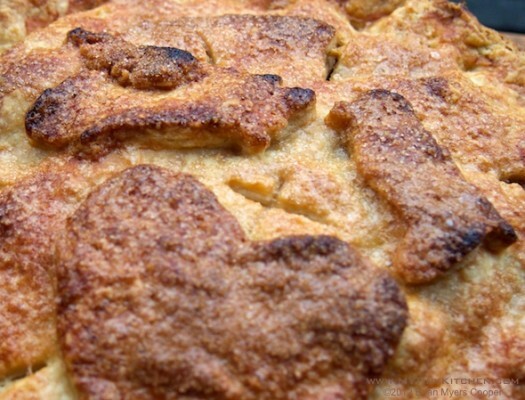 Had I not found it, or the Zip Card, this pie might well have been the $850 Apple Pie! With gratitude, I popped up the Zip Car app and extended our reservation so we could pick the rest of our apples without rushing and enjoy our afternoon. Little side note: the delay caused us to be checking out just as they were bagging up some fresh, hot cider donuts still crunchy on the outside and pillowy soft on the inside. Score! We washed them down with some fresh apple cider before we headed south with our harvest. In this recipe, Granny Smiths and McIntosh are fine staples, but I encourage you to branch out to other intensely flavored apples, mixing a tart apple with a crisp, sweeter variety like Orville did with those amazing Mutsus and Fujis. I forced Orville into the Corn Maze (the Maize Maze? ), and I can report that we made it through intact thanks to his unerring homing instincts. 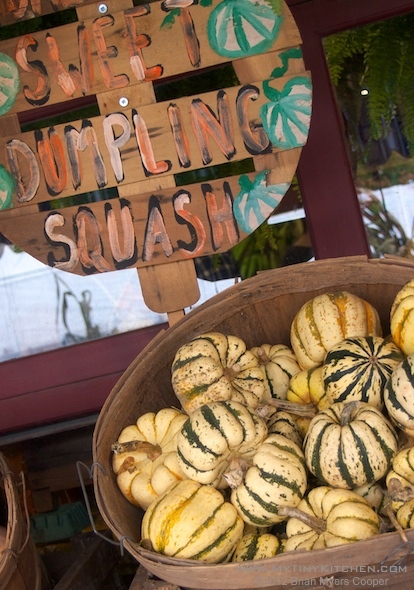 This year, we headed home with a variety of squash–Delicato and Sweet Dumpling. Expect some My Tiny Kitchen Squash recipes this fall! Move oven rack to lowest level. Place baking sheet on it and heat oven to 500 degrees. Roll ½ of the pie dough recipe on a floured surface into a 12 inch circle. Roll onto your rolling pin and transfer to a 9 inch deep dish pie plate. Gently ease dough in to the dish–do NOT stretch it; instead, lift one side and ease the opposite corner into the bottom. Do not trim yet; refrigerate for 1 hour. Peel, core and slice into ¼ inch slices. In a mixing bowl, toss the apples with the lemon juice and zest. Mix the flour, sugar, spices and salt to combine, then toss the dry ingredients with the apples. Put the apple mixture and all the juices into the chilled pie shell, mounding them slightly in the center. OK… that’s a winged Pig and a Penguin (the boot shaped thing on the right) and a heart. I won’t bore you with the sappy history that led to this being on top of this pie. 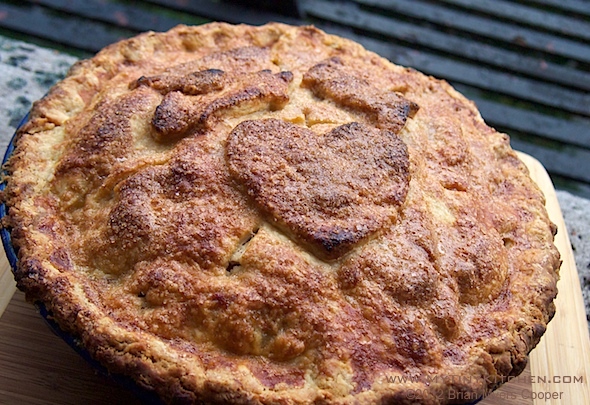 Suffice to say that every pie needs a heaping cupful of love – do something fun! Roll out the second half of the pie dough recipe into a 12 inch circle. Use your rolling pin to transfer it on top of the filling. Trim the edges so the dough hangs over the pie dish by ½ inch. Tuck this overhanging dough under and seal by fluting or pinching it pressing on the outside edge with your thumb and forefinger, and from the interior of the crust with the opposite thumb. Or you can seal it by pressing down with the tines of a fork. Cut four slits in the top. If you’re feeling artistic, form leaves or other decorative touches from the dough scraps and place on top. Brush the top with the egg white wash and sprinkle very liberally with the turbinado sugar/Sugar in the Raw. Place pie on the baking sheet and lower oven to 425 degrees. Bake for 25 minutes – top will be golden. Rotate the pie 180 degrees and lower oven to 375 degrees. Continue baking for 30-35 minutes until juices bubble and crust is deeply golden. Cool on a wire rack to room temperature, about 4 hours. Yeah, right. Like that’e gonna happen. But give it at least an hour for the apples to set up a little and so you don’t burn your tongue or melt your a la mode too quickly! In a measuring cup, combine the water and vodka with 3-4 ice cubes to chill it thoroughly. Set aside. In a food processor, pulse the dry ingredients to combine. Scatter the shortening on the dry ingredients and process to a course sand texture, about 10 seconds. Scatter the butter over the mixture and pulse to cut the butter into the mixture until it looks like coarse crumbs, about 10 1-second pulses. Turn the mixture out into a mixing bowl. Sprinkle 6 Tbsp of the water/vodka mixture over the dough and fold with a spatula to mix just until the dough sticks together, adding up to 2 more tablespoons of the ice water/vodka. Divide into two balls and flatten each into a 4 inch disk. Wrap well in plastic wrap and refrigerate for at least 1 hour or up to 2 days before you roll it out. You can also put the wrapped disks into a ziplock freezer bag and freeze them for one month.